Good news for anyone interested in popular sociology. 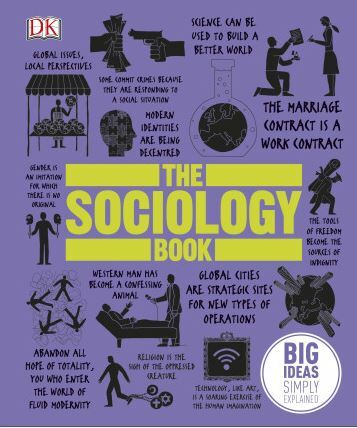 The Sociology Book / Big ideas simply explained was published (July 2015, DK Publishing). With 88 sociologists, their short biographies, some great quotes and time-lines and simple, visualized summaries. Somehow, at DK Publishing, they manage to get their popular science books sold in fashion stores. I once ran into The Psychology Book and The Philosophy Book in a German fashion store. Just great to be able to shop knowledge together with skirts and jeans. The best thing about this book: it finally includes many authors who had been excluded from the heart of sociology for too long. Ibn Khaldun opens history (1332-1406) being among the first of authors to publish on social cohesion. And we get to know Harriet Martineau as an early key figure (1802-1876) on morals and manners. Other important authors like Jane Jacobs are included – “There must be eyes on the street” – and Arlie Hochschild on the subject of emotional labour. This without missing out on interesting classic authors, from Tönnies on Gemeinschaft und Gesellschaft to the big three – Marx,Weber and Durkheim – and essential authors like for example Foucault, Habermas, Bourdieu, Butler and the Becks. The smart re-representation of the 88 authors makes sociology fit for future readers. Like a large intellectual buffet really, where you can try out and taste different bits and bytes of knowledge on society, groups and identity. Nothing negative about the book? Of course all arguments against summaries and selections are valid. Why explain Adorno in 100 words, Habermas in two pages and Foucault in eight? Where has Pitirim Sorokin gone? Will Claude Levi-Strauss and Mary Douglas turn up in the Anthropology Book? I missed the Cosers, Lewis Coser and Rose Laub Coser with their works on groups, conflicts and individualization. And what about any Chinese, African or Dutch sociologists? To discover in volume 2? Sociology is not a global, nor a universal science. The universal may not be possible, but the global? As Wiebke Keim concluded in her research (Vermessene Disziplin 2008): Anglosaxon/Western dominance leaves others with a lot of work to do and with an obligation to show cultural varieties from different angles. Or, in the quoted words of Arjun Appadurai: ‘Different societies appropriate the materials of modernity differently’. The solution to non-globalist sociology may be this simple: engage some (migrant-)authors or consultants from non-western, non-anglosaxon parts of the world in the contributors team? But sociology is clearly on its way, with lots to discover in this book. What do you know about Boaventura de Sousa Santos. Eliah Anderson and Christine Delphy?